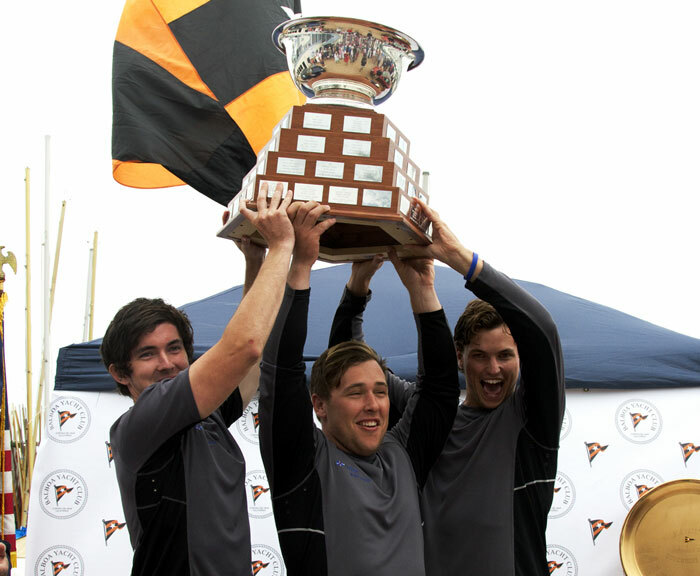 NEWPORT BEACH — Sam Gilmour and his team from Australia’s Royal Freshwater Bay Yacht Club won the second, third and fourth races for “best of five” in the finals, taking first place in the 47th annual Governor’s Cup regatta hosted by Balboa Yacht Club July 16-21. Chris Steele and the Royal New Zealand Yacht Squadron team took second place in Governor’s Cup, and the top two teams remained very competitive throughout the regatta. In the petit final, the two top U.S. teams — from San Diego Yacht Club and regatta host Balboa Yacht Club — were tied after two races. Balboa YC’s Ryan Davidson was able to defeat A.J. Reiter and his team from San Diego by more than a boat length in their third race. Balboa YC ended up placing third in Governor’s Cup, with San Diego Yacht Club taking fourth place. Third place is the best finish in the Governor’s Cup for many years for Balboa YC. The last time Balboa YC won the Governor’s Cup was 1980. Fifth place went to Chicago Yacht Club, sixth to San Francisco Yacht Club, seventh to Cruising Yacht Club of Australia, eighth to Royal Port Nicholson Yacht Club, ninth to Newport Harbor Yacht Club, 10th to Portland Yacht Club, 11th to the women of Royal New Zealand Yacht Squadron and 12th to Royal Prince Alfred Yacht Club. The winner of the sought-after Sportsmanship Award was the team from San Francisco YC: Scott Buckstaff, Corey Lynch and James Moody. The perpetual trophy is named for Chet Purcell, one of the founders of the Governor’s Cup Challenge — and his son, Staff Commodore Tom Purcell, presented the award. The invitation-only match-racing regatta was established by the late Chet and Glee Purcell, who had a vision that a national match-racing competition should be created for younger sailors, similar in format to the internationally recognized Congressional Cup regatta in Long Beach. As the years progressed, the Governor’s Cup grew in popularity, with its first international team participating in 1989. Since then, teams from the Argentina, Australia, Brazil, Finland, Ireland, New Zealand, Spain and the United Kingdom have participated and have become regular entrants — and often multiple winners. The Cup has served as a gateway for future champions in collegiate competition, the Olympics, Congressional Cup, the Swedish Match Tour and numerous America’s Cups. Past participants include the America’s Cup-winning helmsman and tactician, James Spithill and John Kostecki; and other top sailors, including Paul Cayard, Morgan Larson, Argyle Campbell, Mark Christensen, Dean Barker, Morgan Trubovich, Gavin Brady, Paul Campbell-James, Cameron Appleton and Tim Wardlow. This year’s Governor’s Cup racing started at noon July 17 in ideal conditions, with winds of 9 knots out of the west. By the end of the day the winds increased to about 18 knots with heavy chop. The temperature was in the low 70s. The winds the rest of the week were milder and often shifty. In the initial round-robin series, each team raced every other team in match racing — two boats at a time. Each race had two umpires in a small boat nearby. The umpires made quick decisions about any infractions or protests, keeping all penalties immediate and on the water, and out of protest rooms. In the final day of competition, the weatherman threatened thunderstorms, but they did not appear. The occasional light rain did not discourage the racers. The top four boats were towed out, accompanied by an extensive spectator fleet. The wind came from the southwest at about 6 knots, with short chop and waves about 3 feet apart. A short course was set up, with about 2 miles to the weather mark. Temperatures remained in the low 70s throughout the final race day. Reiter and his San Diego YC team of Storm Brown and David Larson had no wins on the first day, but they came from behind on the second day, ending up tied for fourth. Then, they won the tiebreaker, since they had the better record, and they were able to compete on the final day. They became more familiar with the boat and reportedly received good advice from Nevin Snow, who had won the regatta in 2011. On the weekend after Governor’s Cup, four of the skippers competed in an adult match-racing regatta in Vancouver, British Columbia. Adam Middleton, Chris Steele, Claudia Pierce and Ryan Davidson competed against each other, as well as Royal Vancouver Yacht Club match racers with many years of racing experience. For more information on this year’s Governor’s Cup regatta, visit balboayachtclub.com.